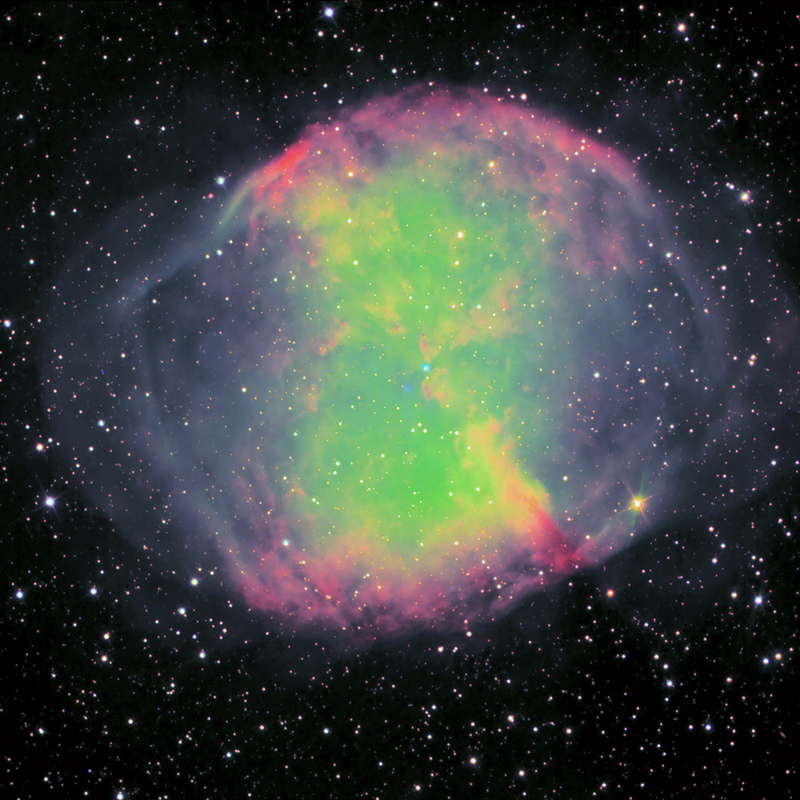 A well-known deepsky target, M27, for Christmas day ! I remember that the clouds have shortened 2 of the 3). only medium and reduced the resolution of the global image. It's a pity ! From the detectivity point of view (faintest stars) Adam's image is better. is only a little bit better. QHYCCD QHY 174 M (cooled) no filter. 13915 x 0.4 second. Gain = 48. (10159+10989) x 0.4 second. Gain = 45. 5601 x 1 second. Gain = 45. QHYCCD QHY5III 178 C (uncooled) + Ir/UV cut. 934 x 5 seconds. Gain = 40. Manual sort out of RAW image. Post-processing with Iris + Photoshop. Edited by XS_Man, 24 December 2017 - 11:43 AM. Edited by XS_Man, 26 December 2017 - 01:15 PM. Stunning result. You are one of the masters in short exposure DSO. Edited by astromomo, 30 December 2017 - 06:01 PM. Fantastic result, considering the site and telescope size. Lucky deep sky imaging really has a bright future! 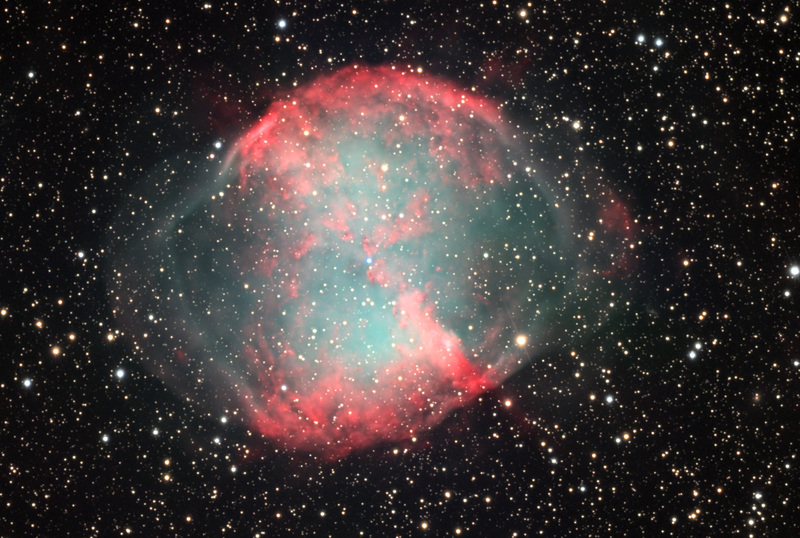 For a comparison with yet another (much larger) telescope at a professional site where subarcsecond seeing is often possible, here's my shot of M27. Scope was 1.4m f/8, and because filters professionals use (UBVRI) are somewhat different from "our" RGB palette, colors are different yet again. But resolution is there if you want to compare! That's a very nice image from a big professionnal telescope even if the color palette is strange for my "RVB eyes". 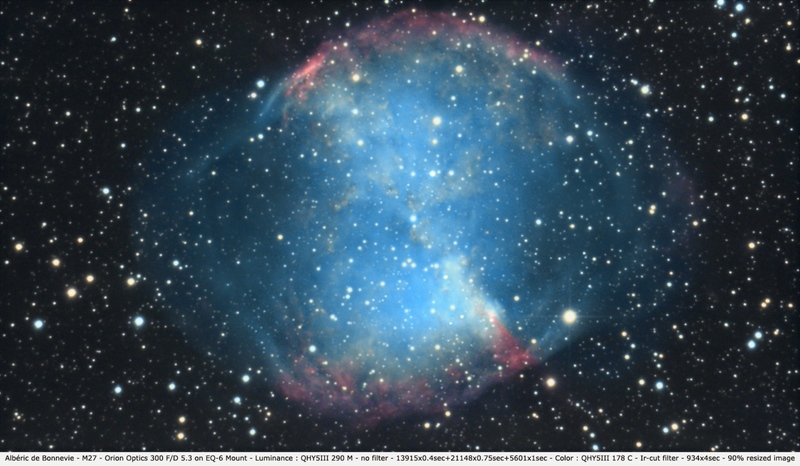 I've compared : resolution is the same as Adam's reference picture (with a 500 mm telescope). Without adaptative optics system, it's a great result ! these very medium seeing conditions ! Edited by XS_Man, 18 January 2018 - 05:09 PM. Thanks very much Moïse ! Hope that you will post your own images on the forum ! She is beautiful this apple!